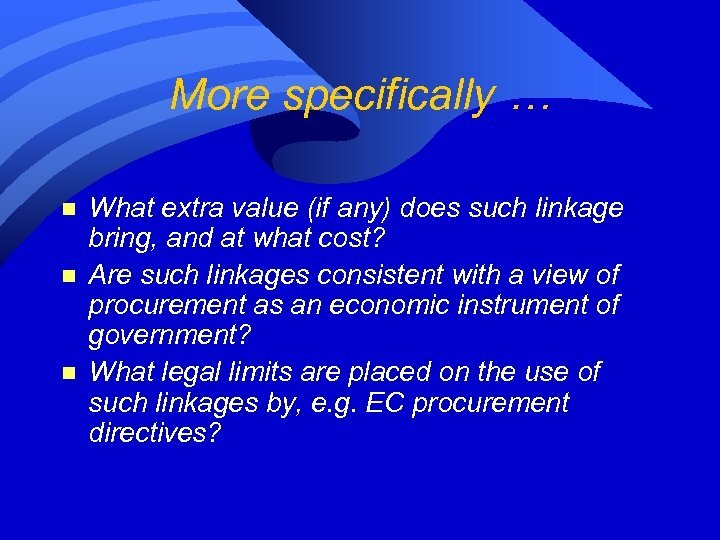 More specifically … n n n What extra value (if any) does such linkage bring, and at what cost? 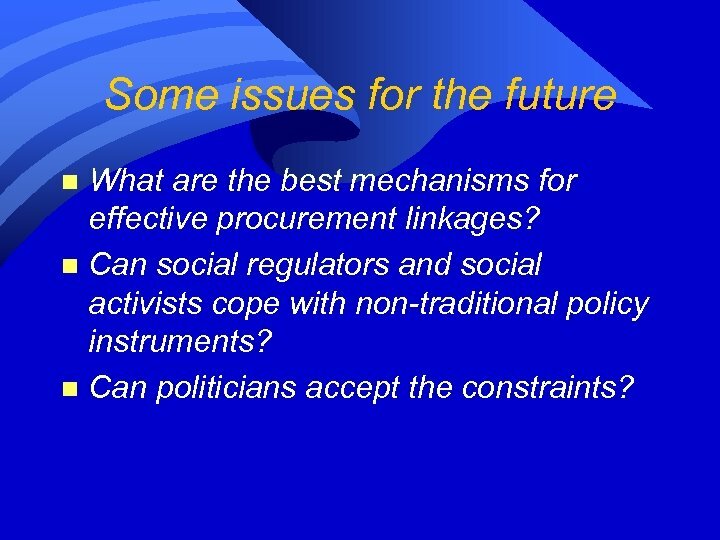 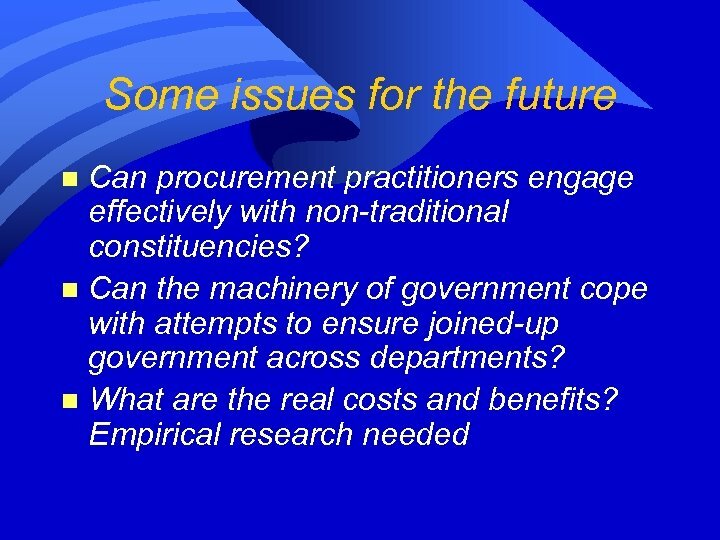 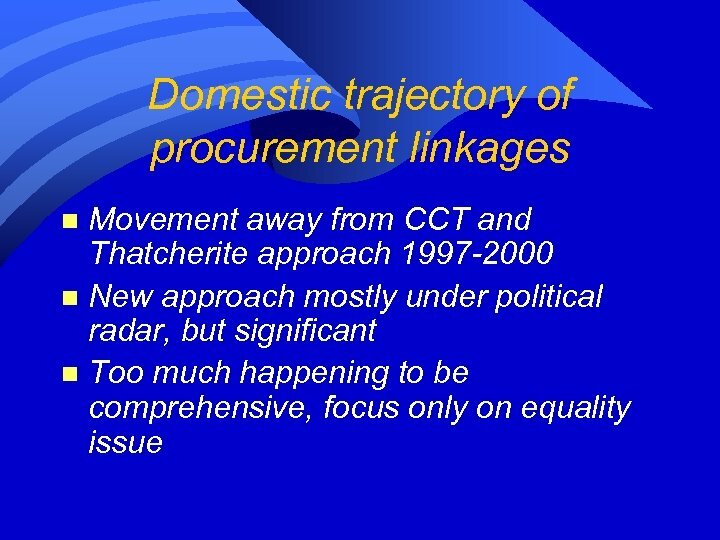 Are such linkages consistent with a view of procurement as an economic instrument of government? 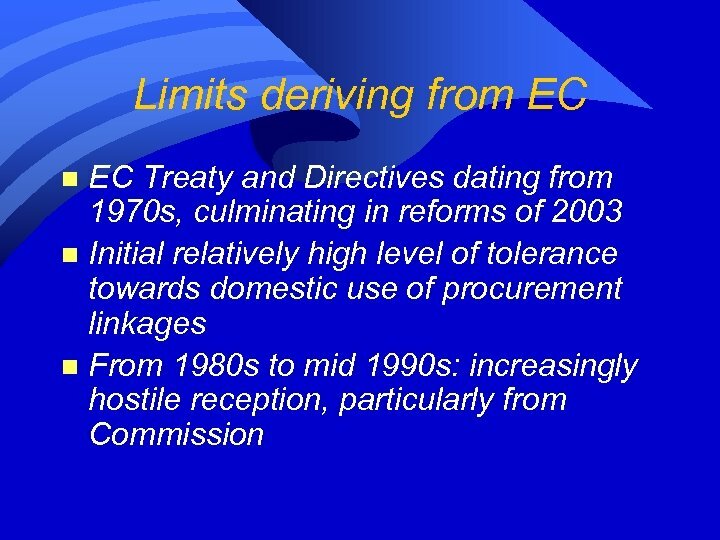 What legal limits are placed on the use of such linkages by, e. g. EC procurement directives? 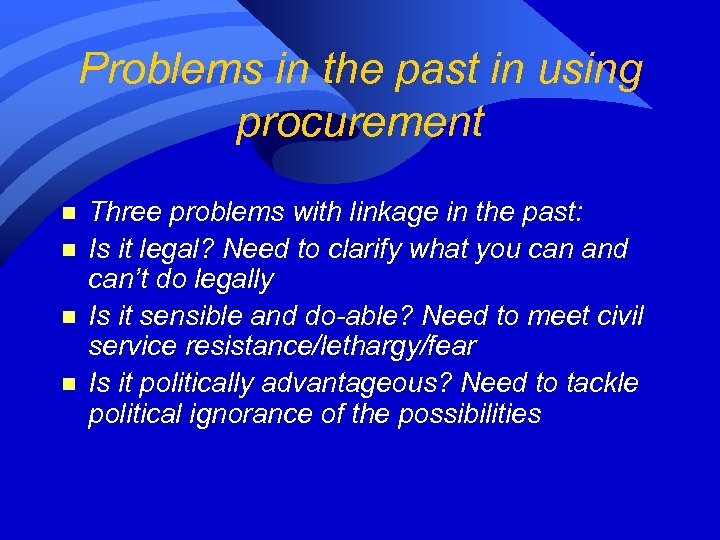 Further issues to be considered n n n To whom should the procurement duties apply? 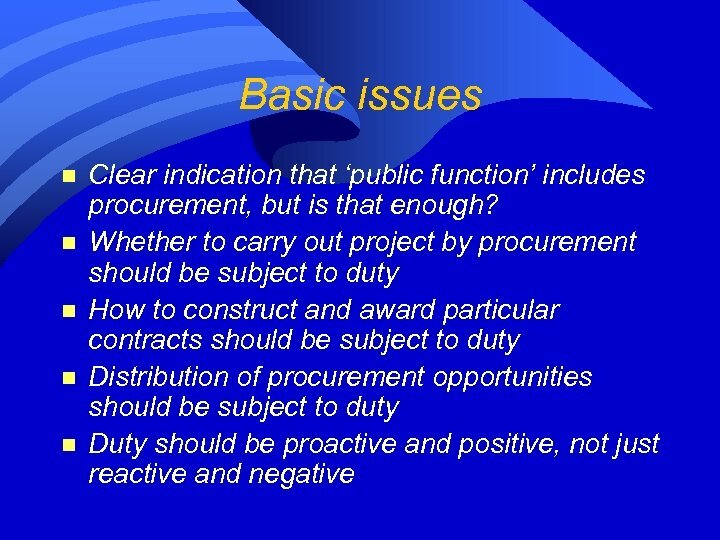 To what contracts should the procurement duty apply? 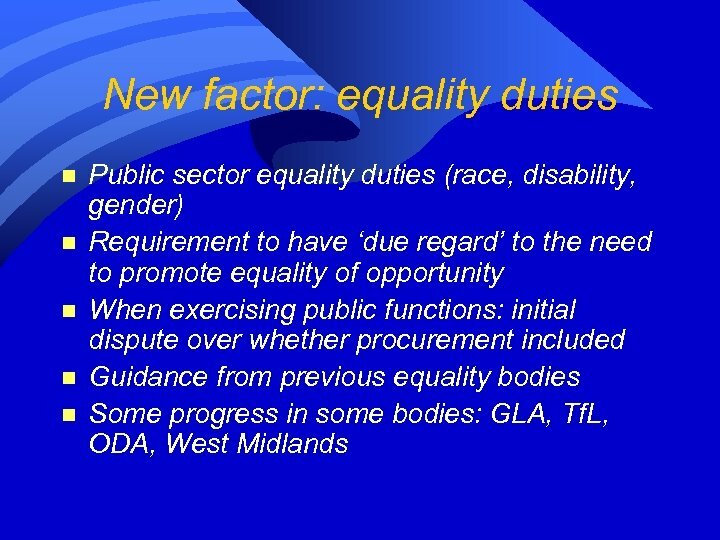 Do we legislate further what we mean by ‘equality of opportunity’? 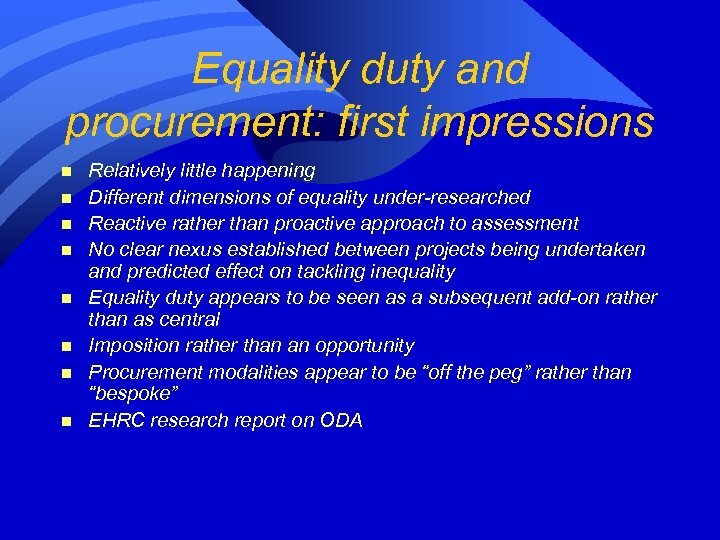 Do we legislate further what we mean by‘due regard’? 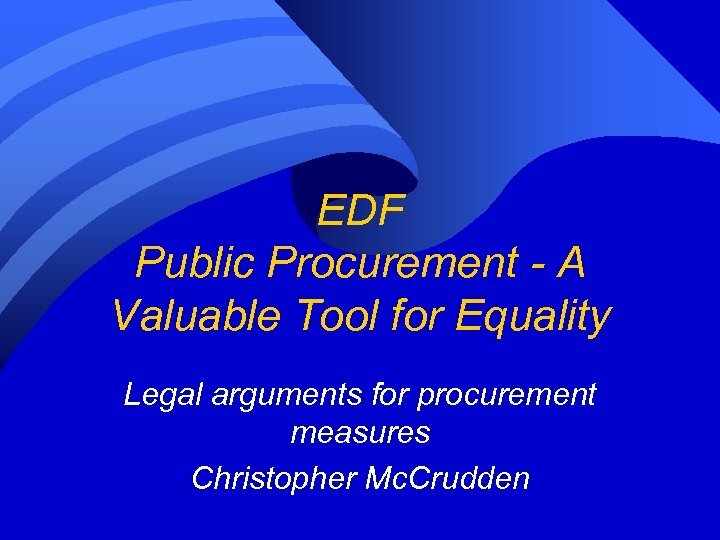 What do we do about ‘value for money’? 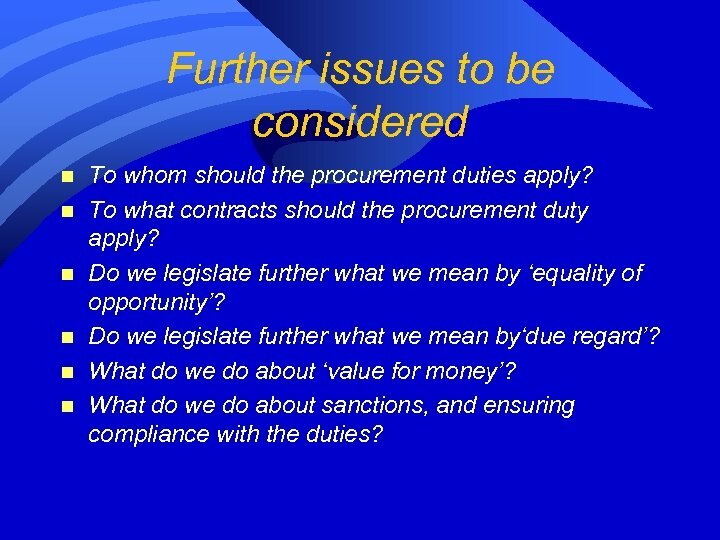 What do we do about sanctions, and ensuring compliance with the duties? 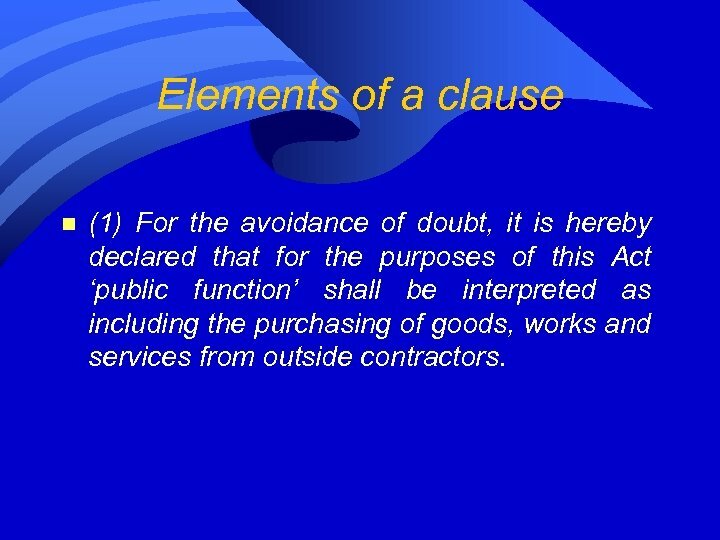 Elements of a clause n (1) For the avoidance of doubt, it is hereby declared that for the purposes of this Act ‘public function’ shall be interpreted as including the purchasing of goods, works and services from outside contractors. 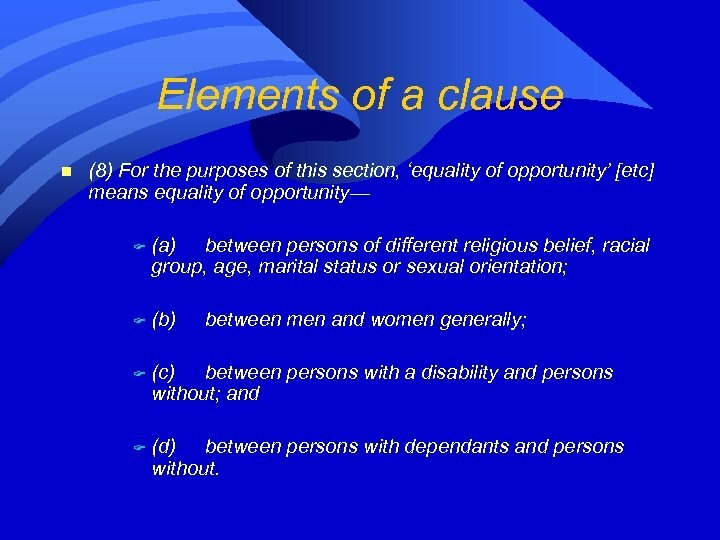 Elements of a clause n (2) Without prejudice to any other obligation in this Act, a public authority shall have due regard to the need to [promote equality of opportunity, etc] when determining the desirability of exercising any of its functions by way of contract. 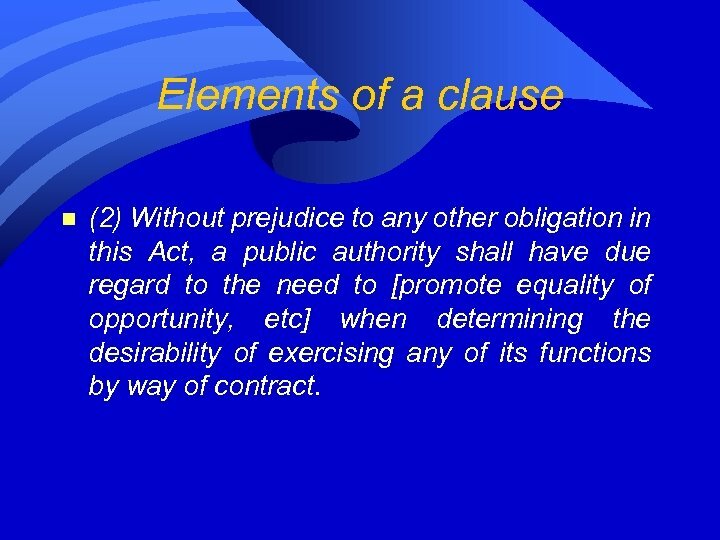 Elements of a clause n (3) Without prejudice to any other obligation in this Act, a public authority shall have due regard to the need to [promote equality of opportunity, etc]— (a) when determining the appropriate definition of the subject matter of each of its contracts, (b) when determining the technical specifications of each of its contracts, (c) when establishing selection criteria for each of its contracts, (d) when establishing criteria for the award of each of its contracts, and determining the weighting to be given to these criteria, when the contract is awarded to the most economically advantageous tender, (e) when considering whether a bid is abnormally low, where any of its contracts is subject to competitive bidding, and (f) when considering the inclusion of contract performance clauses in each of its contracts. 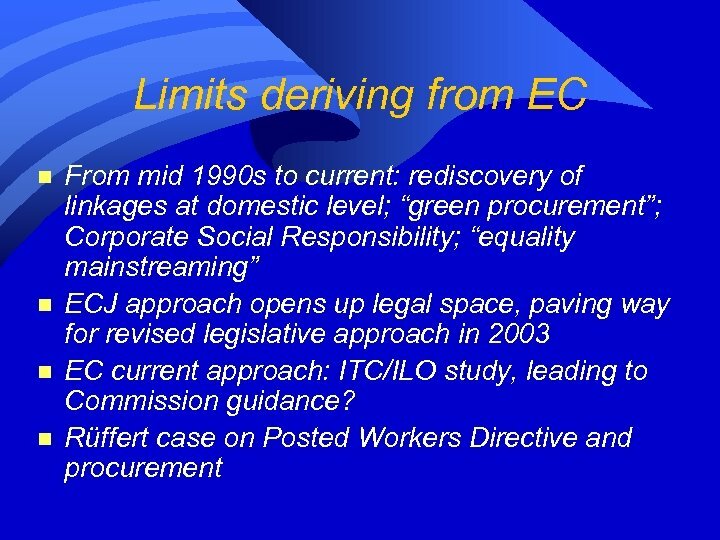 Elements of a clause n (4) Without prejudice to any other obligation in this Act, a public authority shall consider how best to encourage particular classes of firms that are under-represented in contracting with that public authority in comparison with other classes of firms to undertake more contracting for that public authority, having due regard to the need to promote [equality of opportunity, etc]. 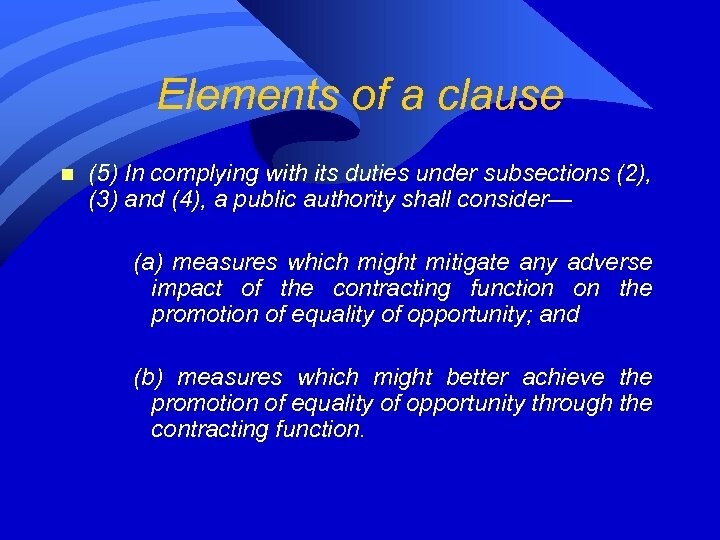 Elements of a clause n (5) In complying with its duties under subsections (2), (3) and (4), a public authority shall consider— (a) measures which might mitigate any adverse impact of the contracting function on the promotion of equality of opportunity; and (b) measures which might better achieve the promotion of equality of opportunity through the contracting function. 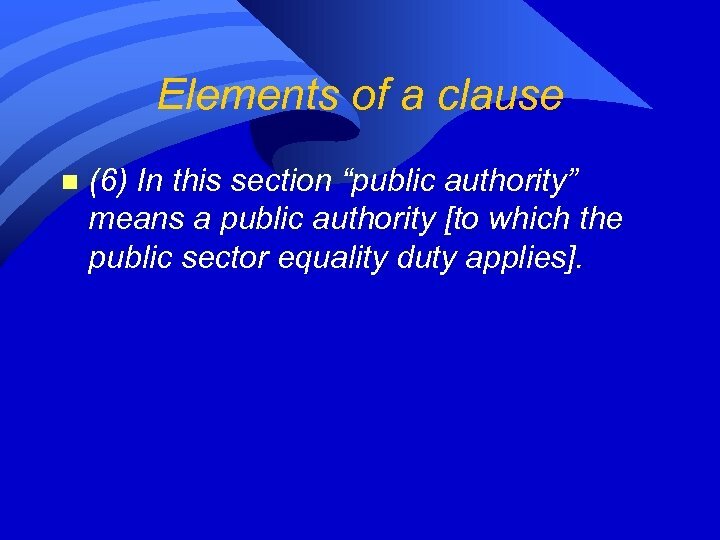 Elements of a clause n (6) In this section “public authority” means a public authority [to which the public sector equality duty applies]. 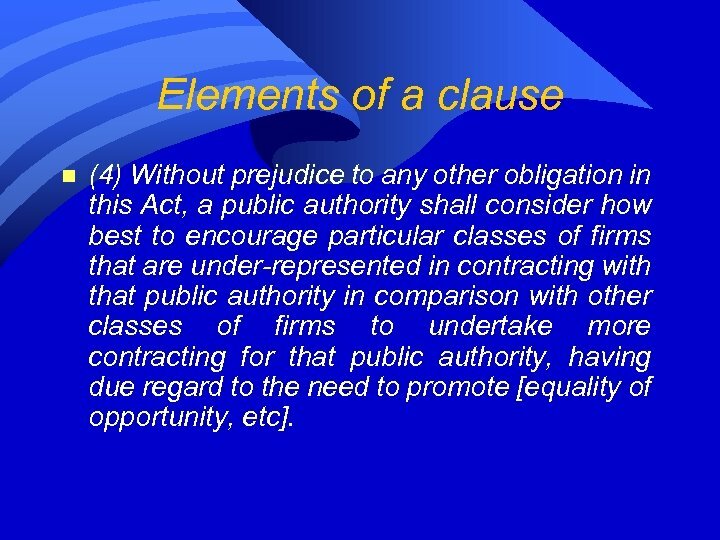 Elements of a clause n (7) Without prejudice to its duties under subsections (2), (3) and (4), a public authority shall in carrying out its functions relating to contracting have regard to the desirability of promoting value for money in the use of public funds. 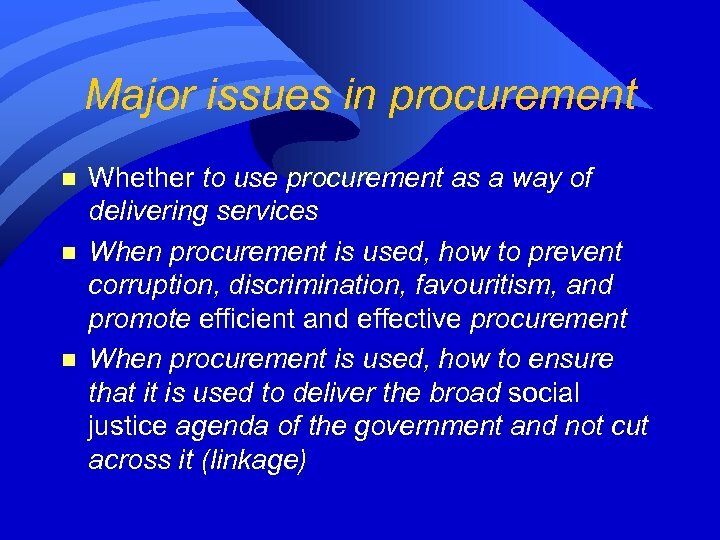 For the purpose of this subsection, ‘value for money’ means. 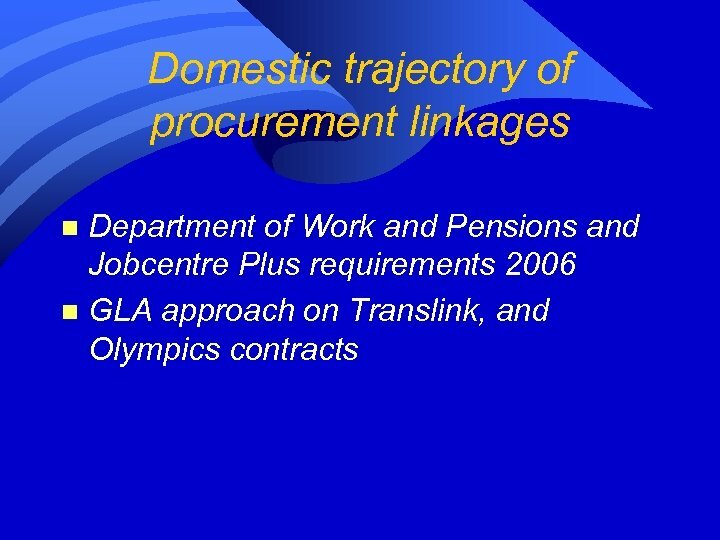 F (a) securing works, goods or services without disproportionate expense, and F (b) the optimum combination of whole-life costs and quality to meet the public authority’s requirements. 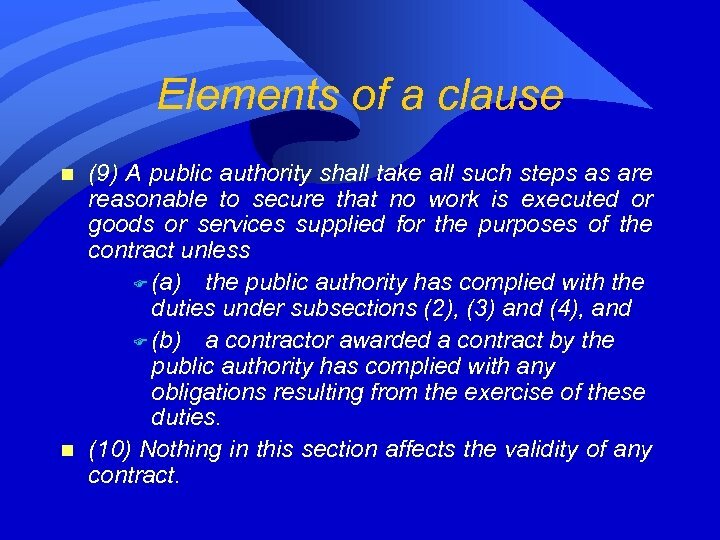 Elements of a clause n n (9) A public authority shall take all such steps as are reasonable to secure that no work is executed or goods or services supplied for the purposes of the contract unless F (a) the public authority has complied with the duties under subsections (2), (3) and (4), and F (b) a contractor awarded a contract by the public authority has complied with any obligations resulting from the exercise of these duties. 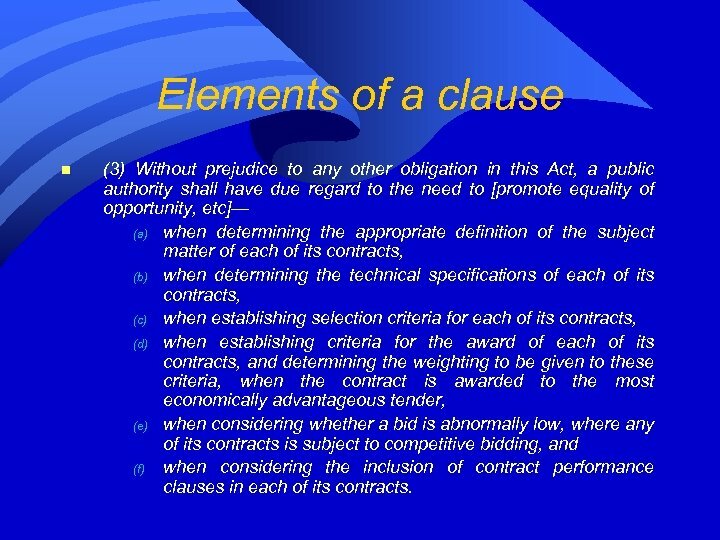 (10) Nothing in this section affects the validity of any contract. 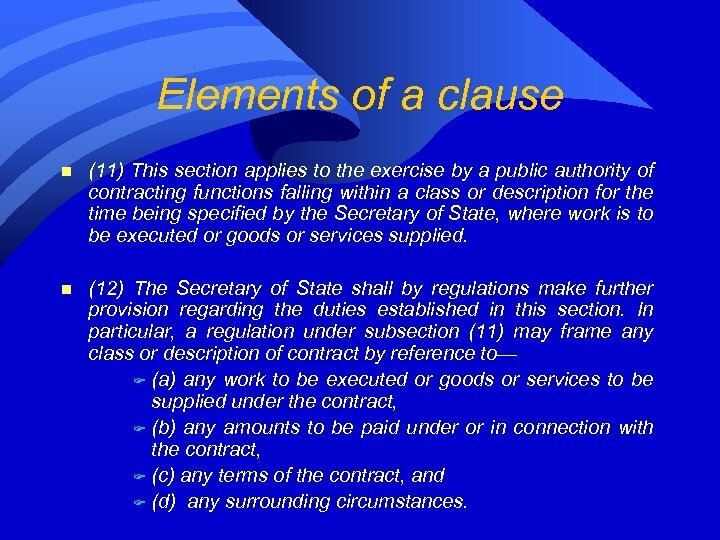 Elements of a clause n (11) This section applies to the exercise by a public authority of contracting functions falling within a class or description for the time being specified by the Secretary of State, where work is to be executed or goods or services supplied. 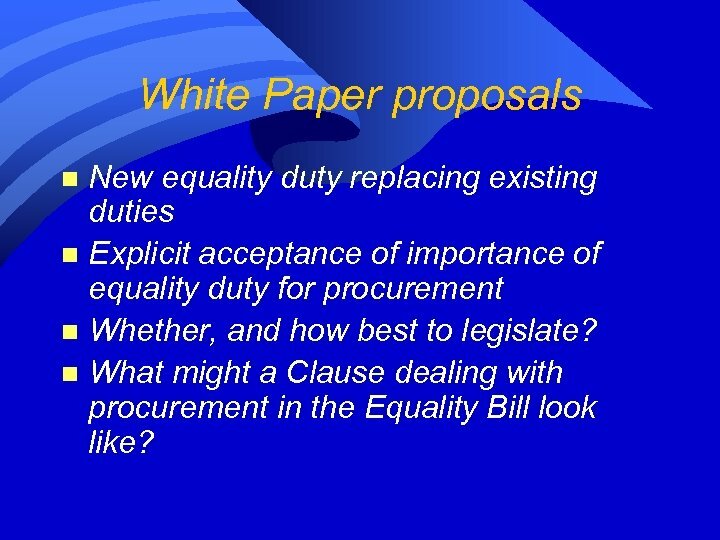 n (12) The Secretary of State shall by regulations make further provision regarding the duties established in this section. 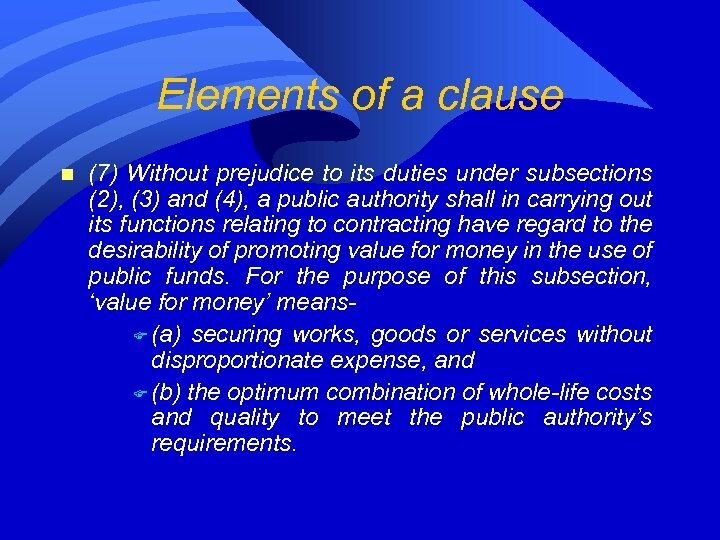 In particular, a regulation under subsection (11) may frame any class or description of contract by reference to— F (a) any work to be executed or goods or services to be supplied under the contract, F (b) any amounts to be paid under or in connection with the contract, F (c) any terms of the contract, and F (d) any surrounding circumstances. 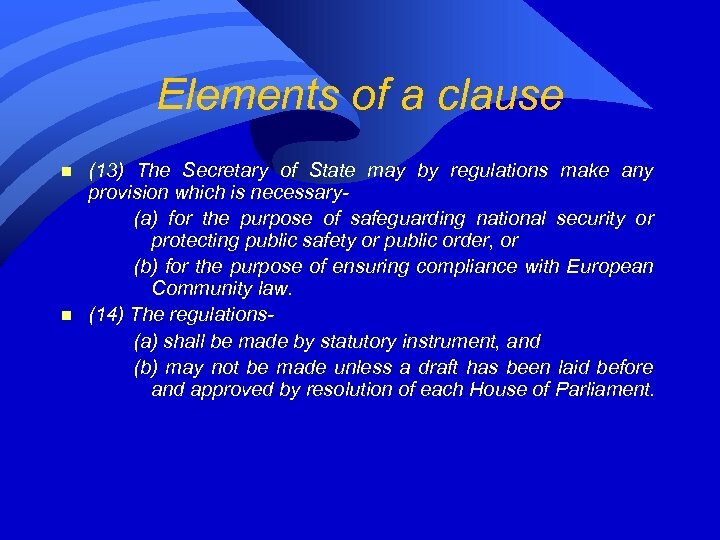 Elements of a clause n n (13) The Secretary of State may by regulations make any provision which is necessary(a) for the purpose of safeguarding national security or protecting public safety or public order, or (b) for the purpose of ensuring compliance with European Community law. 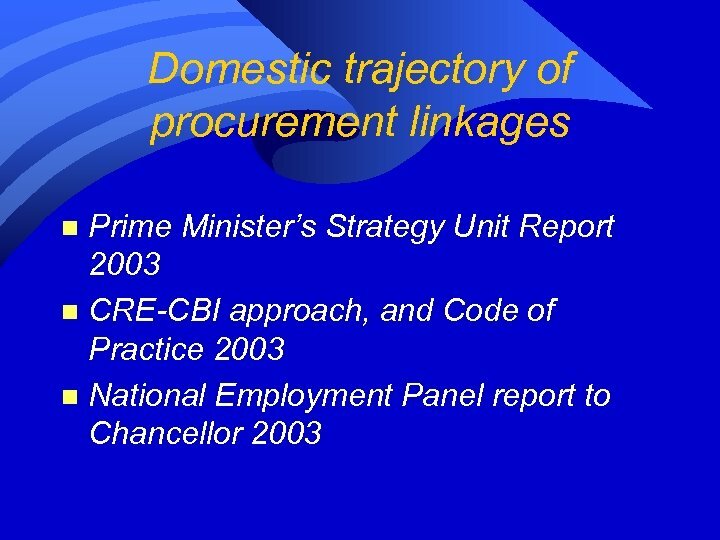 (14) The regulations(a) shall be made by statutory instrument, and (b) may not be made unless a draft has been laid before and approved by resolution of each House of Parliament.